Anthony began learning web development in high school. 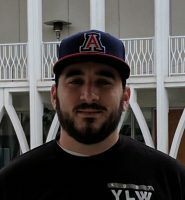 And, though he didn’t finish, spent several college years, at Pima Community College and The University of Arizona, doing coursework, ranging from engineering, computer science, physics, and upper level mathematics courses to marketing, business, and graphic design courses. This wide range of learning gives him a unique perspective on web development, and helps him to truly appreciate the art that programming is. He has never felt more fulfilled in his work than when doing development, teaching development, and raising up new developers. He is an avid board game player, his collection has more than 40 games. He has run a Dungeons and Dragons group for the past year. He has one dog named Luna, she is a husky-boxer mix. One week in 2016, him and a friend went to five different concerts in 10 days, driving up to three hours each way for each concert, and miraculously still made it in to work after each one.